Oh yes, there is no denying that this baby-boomer will be qualifying into the half-centurion's club this year! How I've managed to reach this point in life, still in one piece is quite a big blur to me. I've become an amnesiac for the most part of my early years and I am pretty selective of my memories in the twenty-something and thirty-something years. Forty-something is the most happening years of my life and if I can't fully retain these memories, then I guess I will have to start preparing for dementia ... sadly I do have a family history for that. I am happy how life has turned out for me at the moment. Why not?! I am still married after 26 years, a son who's turned 22 and working on a future for himself, a beautiful home, family and friends. Not forgetting too, I am retired to do anything I want, anytime, anyhow. 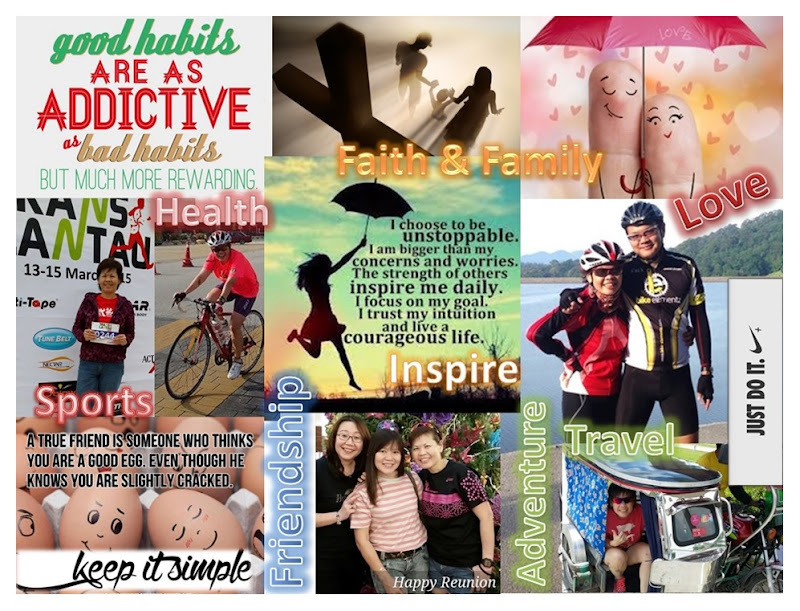 But these are common denominators of a life well-lived ... not yet to the fullest. So before I hit the actual milestone, I figured I'd better get some real achievements into my gunny sack. While they may easily make it into my 50th Birthday wishlist I have prepared for myself, achieving them may require a lot of self-talk with myself! 1. 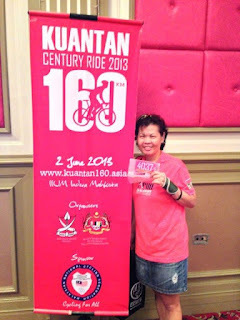 Kuantan Century Ride 2013 - a 160 km bicycle ride which unfortunately I had to forgo due to a hand injury. I will claim this belated birthday present next year in Kuantan Century Ride 2014. 2. Muar Cross-country Run 2013 - The furthest I've ever participated in a running race was 12 km in Perth. 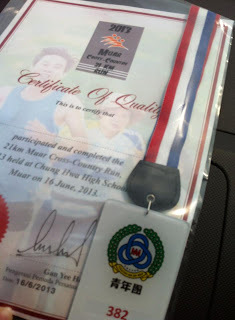 Thankfully, I managed to complete my first ever 21 km run in the town I grew up in. No more such runs for me ... close shop! 3. 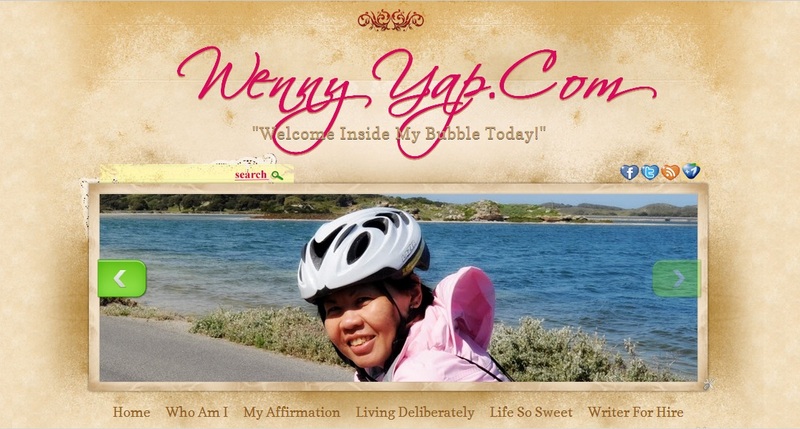 Register My Domain - Yes I have done it! After months of ficklemindedness, I've finally registered my own domain and my blog is now redirected to it ... www.wennyyap.com. All the unnecessary worries about technical glitches and loss of traffic ... sometimes reading too much forum can be counterproductive. 4. TMBT Ultra Marathon 2013 - The Most Beautiful Thing Ultra-trail marathon to be held in Kota Kinabalu, Sabah where I hope to complete the 50 km challenge in one piece. As it will be held in my birth month, this will be the ultimate birthday wish. 5. Publish my first proper ebook - I am in the midst of writing it and fingers-crossed, I'm able to say afloat with the ideas and inspirations. Toes-crossed, I'm able to complete and publish it within 2013. Well it's only 5 items on my wishlist but should anything new give me the fancies, I won't have any qualms to add-on to the list. So far 2 down, 3 more to go. Wish me luck!